Freelance Apr19: European Parliament elections - EU nationals register to vote by 11 April! UK nationals watch this space! Local elections in England (outside London) and Northern Ireland on 2 May. European Parliament elections - it's complicated! 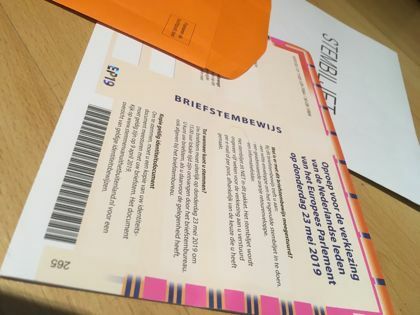 Registration form for the European Parliament 2019 elections, with the EP19 hologram on the left near the top. This one has a bright orange return envelope addressed to its Member State's London embassy. OUR MANY members who are nationals of one of the "EU 27" Member States that aren't supposed to be Brexiting will need to register to stay in the UK post Brexit - see advice on EU Settled Status here. But the good news is that those who remain EU nationals still get to vote in the European Parliament elections on 23-26 May. Different Member States vote on different dates within that spread of four days, to elect Members of the European Parliament (MEPs). If this includes you, you will be voting in the country of which you are a national - either by postal ballot or in person at your embassy or consulate in the the UK. Normally there are European Parliament elections in the UK as well, with a lot of publicity about deadlines to register, but we are living in strange times so you may not have noticed there's still a European Parliament election on. Check the website of your embassy in the UK, this will have details of how to apply for a postal ballot or for a polling card to vote in person at your consulate. Different member states will have different deadlines for registering, in theory everyone needs to be registered by 11 April, probably by airmail, so get a move on. If you're already registered with your embassy in the UK and they have your address, the forms will be on their way to you if they haven't arrived already. The European Federation of Journalists (EFJ, of which the NUJ is a part,) has launched a Manifesto for the revival of a free and pluaralistic media ahead of these elections. This is where it gets complicated. The UK at the time of writing isn't taking part in the European elections, as it was supposed to have left the EU on 29 March. At the time of writing, there is an extension of the Brexit deadline until 11 April - yes, the deadline for registering for European Parliament elections! By that date, the UK has to either leave the EU or ask for a further extension - possibly until 22 May, the day before the European elections, or possibly until much later, which means the UK is taking part as well. Should the UK participate in European elections, expect a rather big announcement. Whether the UK votes along with other Member States by 26 May, given such short notice, is unclear. There is a precedent for voting later - Bulgaria held its first elections to the European Parliament outside the cycle of regular EU-wide elections in 2007, partly as it was felt the result would cause a political crisis nationally. It's a criminal offence to vote in the European Parliament elections in more than one Member State. So in the event of the UK still being in the EU on 22 May, it will get complicated for those EU nationals in the UK who've registered to vote in the country of which they are a national and who now want to vote in the UK instead. These can still register to vote in their "home" country and decide not to vote there if the opportunity to vote in the UK arises after all. Back in the UK, many county, county district and metropolitan authorities in England - outside London - and in Northern Ireland have local elections on Thursday 2 May. There are some mayoral elections in England (outside London). There's a list of those councils having elections here. Check the "electoral services" section of your local authority website to see whether yours has elections and the deadlines for registering. EU nationals can at the time of writing still vote in UK local elections, but if we've already left the EU by 2 May, especially without a deal, nationals of some EU Member States will lose their vote. In the event of the UK still being in the EU on the date of the local elections, expect a complex announcement on eligibility.